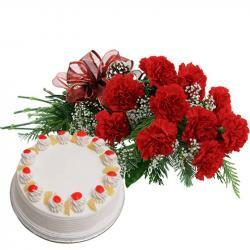 Product Consists : Bouquet of 25 Red Roses along with 1.5 Kg Heart shape Chocolate Truffle cake. Send her this WARM and BIG Hug of Red Roses to make your way straight to her heart. 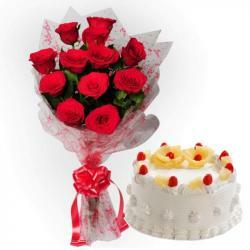 A beautiful bunch of lovely red roses to make her realize your love all over again. This bouquet includes twenty five stems of garden fresh red roses wrap nicely with cellophane. Add some sweetness with special heart shape cake of rich flavor of truffle chocolate. This hamper will mesmerize your special person in India with its sheer elegance. So go ahead and buy this hamper for your love one in India. 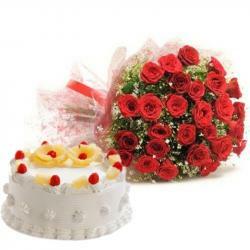 Product Includes : Bouquet of 25 Red Roses along with 1.5 Kg Heart shape Chocolate Truffle Cake.